As you know, before you can become a contractor you must first be audited by the Defense Contracting Auditing Agency (DCAA) for contract approval.Â This audit will include just about everything you can imagine â€“ especially, every aspect of your accounting software.Â To be successful when desiring to become a government contractor, you must be able to comply with the DCAA regulations.Â However, there are still a few companies that use the old school paper and pencil method most use DCAA compliant software.Â What becomes difficult for most companies is the selection of such software.Â There are so many on the market trying to wrap your head around the offerings is exhausting.Â To ease the difficulty, use these few tips. Make sure your company isnâ€™t simply able to afford the DCAA compliant software; you have to make sure you can implement the software to its most optimized abilities.Â This includes making sure you can afford technical support beyond what may come with the software package and software training.Â Itâ€™s imperative that each member of your organization that will deal with the contract is properly trained on the selected software. Look for DCAA compliant software with attributes that will serve your company through each step during the life of the contract.Â This means that the software must be able to record financial data in an accurate and consistent manner. Next, look for DCAA compliant software that can grow as your company grows and is able to handle more than one contract at a time in a differentiating manner.Â Again, proper employee training is crucial if you intend or currently have multiple contracts â€“ you donâ€™t want data to be placed under the wrong contract.Â If data is placed under the wrong contract without being caught before DCAA review, get prepared for a DCAA audit that may very well have you in tears. Because each industry is different with different needs itâ€™s important to make sure that the DCAA compliant software has attributes that can be customized to meet individual company needs.Â This is important in the areas of operations as well as accounting areas; otherwise, your software will fail to supply all the reports necessary to please DCAA. Finally, make sure the software allows for the following:Â detailed and complete reports, segregation of duties, is easy to use, informs of violations and errors, supplies transactions at a detailed level, informs of paid and unpaid costs, provides timesheet listings, incurred costs listings, and allows for different types of invoice options such as time and materials or fixed price. 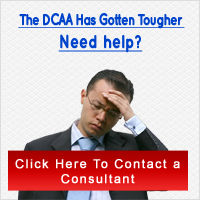 By no means is this an exhausted list, but it will get you started.Â Before making a final DCAA compliant software selection, take the time to do the research on each program on your short-list.Â However, before making it this far, you should have taken the time to question what your company needs to be successful as a government contractor.